The title of this blog is intentional and aims to be provocative. I have borrowed the title from William Easterly’s book, “The White Man's Burden: Why the West's Efforts to Aid the Rest Have Done So Much Ill and So Little Good”​. This is very true of the Global Disability Summit hosted in London. This blog is based on my personal experience and observations of the Global Disability Summit and doesn’t reflect anyone else’s opinion. 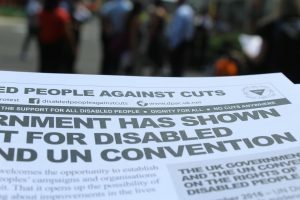 I can say, without a doubt, that the Global Disability Summit was the ideal platform for our UK Government to embarrass and shame those present ‘developing countries’ for their failings with regard to Disabled People (as depicted in the image above) and their purposeful denial of their own wrongs in relation to Disabled People in the UK. We must remember that colonialism and imperialism do not die. The United Kingdom continues to be revered around the world as a country that is the voice of equality. At the Summit, there was an unequivocal message that the UK Government has an effect on other countries in terms of being a leader in disability equality and has paved the way for innovation. It’s no surprise the Summit was hosted on the site of the Global Disability Innovation Hub. 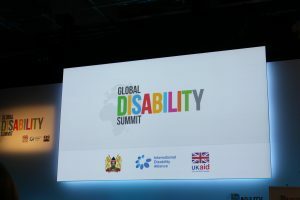 The UK Government co-hosted “its first ever Global Disability Summit with the International Disability Alliance and the Government of Kenya”. The idyllic picture was the reason that had attracted my parents to leave Jamaica for a home in the UK. Then, the UK was portrayed as the, “mother land and paved with gold; a country filled with opportunities”. This was an attractive factor that drew many people to the UK after the Second World War. However, the truth was, the UK needed people from the colony post-Second World War (1948 – 1957) in order to help address the labour shortage. The Caribbean was one of the countries that the UK received huge help from, particularly with regard to building the NHS. Thus, it does not come as any surprise that with Brexit fast approaching, the UK Government is desperate to create global opportunities with their colony. The recent news coverage reports that Theresa May, PM, is looking to secure trade deals with Africa after Brexit. Moreover, the "UK seeks to tap into the Kenyan markets as the Brexit deadline approaches" with this country also being the co-host country of the Summit. However, I’m deeply saddened that the UK Government has ignored the findings of the UN Disability committee. The Disability Committee reported that the UK Government is causing a “human catastrophe” in relation to Disabled People and that they can no longer call themselves leaders of disability provision. As I write this blog, we have Disabled People taking up hospital beds, as in the case of Lakhvinder Kaur because she was evicted from a care home while in intensive care and made homeless. We are seeing history repeating itself, with the UK masking its failings in order to attract help from other countries, create opportunities, secure their own dominance and obtain power at the expense of others. Colonialism reinforces inequality so it will come as no surprise when I tell you that I’m frequently asked questions about where I come from or where I was born. Not satisfied when I reply in the UK, people normally continue with the question; and your parents? I could discuss this issue further but I will not because it is not the intention of this blog. Anyway, I was repeatedly asked at the Global Disability Summit the same questions about where I am from. It became painfully annoying and frustrating. I believe I was asked this question as the images portrayed of UK Disabled Leaders are mostly White Disabled Men and few Women. What this revealed to me is the level of inequality experienced by Black Disabled Women in the UK and reinforced that our presence in the UK is not recognised or embraced. This experience drew me to the Aliens Act (now known as the Immigration Act) which was introduced in the UK to control its borders, immigration and to view non-UK citizens as a threat. A threat is exactly how I was viewed at the Summit. I was totally taken back when I was asked for Identification (ID) at the registration desk. I became vexed instantly. All sorts of thoughts were rushing through my head as I knew assumptions were being made based on my skin colour and the assumption that I was a non-UK citizen. I remained calm and controlled my anger. I asked why ID was needed and why this information was not conveyed during the registration process. My blood was at boiling point because I knew this request was borne out of racism and I knew this system was set up to keep checks on the black oversea delegates to ensure they were at the event and returned to their home countries. So did I provide ID? No, because I knew it was not necessary. And, why were immigration control practices being applied at the Summit, particularly when delegates would have already completed the necessary checks to enter the UK? Once I gained entrance. I rolled into the event but my frustration continued to rise, as well as my disappointment with the obvious signs of racial inequality within the job roles and the way Disabled People from Asian and African countries were being depicted as inferior. It did not matter that this event was being co-hosted with the Kenyan Government; it was clear who the power-holders were. White privilege and power has the ability to discredit the worth of Black People, segregate and create enormous damage in the way Black People are perceived. My feeling of uncomfortableness was painful as the reality is that the privilege of the power-holders has depicted our Black Disabled Sisters and Brothers as helpless and as the the White Man’s burden. In fact, this is far from the truth since through my networking, I have learnt that many of the African countries present at the event have more Disabled People in their Government than the UK Government does. The Global Disability Summit showed no respect for Disabled People globally and no appreciation for our shared experienced. 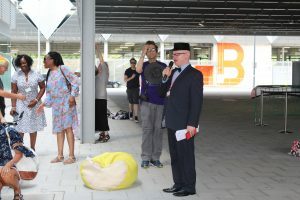 The Summit was used as an attempt to mask "UK failure to uphold disabled people's rights"
The words of Sam Cooke, “A Change is Gonna Come”, expressed the very essence of the International Disabled People movement's demand for solidarity and unity. This is exactly what Disabled People Against Cuts (DPAC) did through hosting the rival International Deaf and Disabled People’s Solidarity Summit, which was a great event where Disabled People from around the globe came together to share our experiences. It did not waste resources and require an elaborate setting to bring people together. It was a perfect example to show why we need solidarity for our struggle and the liberation of Disabled People globally. DPAC also hosted a "festival of resistance" outside the Summit in order to criticise the hypocrisy of co-hosting the Summit. Myself and Nadia Hadad, from the European Network on Independent Living, were prevented from re-entering the summit by security as we had DPAC leaflets (see image below), which were perceived as promoting negative messages about the UK Government. It was through our sister, Sojourner Truth, that I learnt about underground activism. Through her teaching, I managed to slip pass security with the leaflets and shared them with many of the delegates. I also got many Disabled People to leave the Summit and join in the festival, which was a proud moment for me. Another huge applause must go to Alliance for Inclusive Education, Campaigns and Policy Coordinator, Simone Aspis for publicly calling out the UK Government for their failings with regard to Disabled People. Click here to watch and download Simone’s speech. When Marvin Gaye sung, “what’s going on”, it couldn’t be more of a poignant question to conclude this blog with. Angela Davis’ quote perfectly articulates the point of this blog, although her reference relates to America. She says that, “as a black woman, my politics and political affiliation are bound up with and flow from participation in my people's struggle for liberation, and with the fight of oppressed people all over the world against American imperialism”. So when we discuss the question of the advantages and disadvantages of the Global Disability Summit, we need to decide if we want to support colonialism and imperialism or not. The other questions we need to ask are; did the Summit promote solidarity and unity between Disabled People globally or did it promote disability liberation or oppression? Previous PostPodcast on what’s it like to be a Disabled Person in Britain today? Welldone Michelle brilliant article,speaking the truth we need the government to hear.